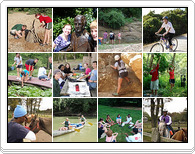 ECO-ACT is an environmental leadership program for juniors and seniors in high school, operated by the Missouri Botanical Garden in partnership with St. Louis area schools and districts. Students enroll for a full year and receive course credit or community service credit from their schools. High school students from St. Louis area schools participate in the program. Current schools are Crossroads College Preparatory, Gateway STEM, Metro Classical, Nerinx Hall, St. Mary's and Villa Duchesne. Students often teach younger students within their district, but currently involved elementary schools also include Webster Groves public schools and various Catholic schools. ECO-ACT stands for ecology in action. 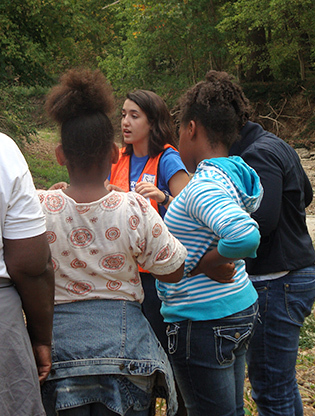 Students learn to recognize and define local environmental problems. They investigate St. Louis by interviewing professionals in the community, traveling to tour sites via public transportation, and then working together to organize, analyze, and present the information to their peers. They learn from each other and develop leadership skills in preparation for service to their school and community. Student teams develop skills for teaching on the themes of environmental awareness, ecology, and conservation, relating to natural resources of plants, animals, water, and energy. ECO-ACT students apply what they have learned about the environment during weekly teaching sessions and field trips with fourth graders. In the spring, ECO-ACT participants lead their students in projects aimed at addressing specific local environmental issues. For more information, please download a brochure or inquire via e-mail.